Northumberland is no ordinary county. Ask anyone who is lucky enough to make it their home, workplace and playground. Ask any tourist or visitor who so dearly wishes for another day at the end of their stay. And another. And another. What to say? Where to begin? A visit to Northumberland is surely limited only by your time and imagination, rather than any possibilities or options. For centuries Northumberland was an infamous buffer zone frontier between warring Scottish and English dynastic ambition. An often dangerous, lawless place wracked by insurrection, war, pillaging and worse. A legacy of this turbulent past is that Northumberland boasts more castles – over 70 – than any other county in England. Many have since disappeared and others stand today as skeletal remains with countless stirring memories of derring-do to recount. 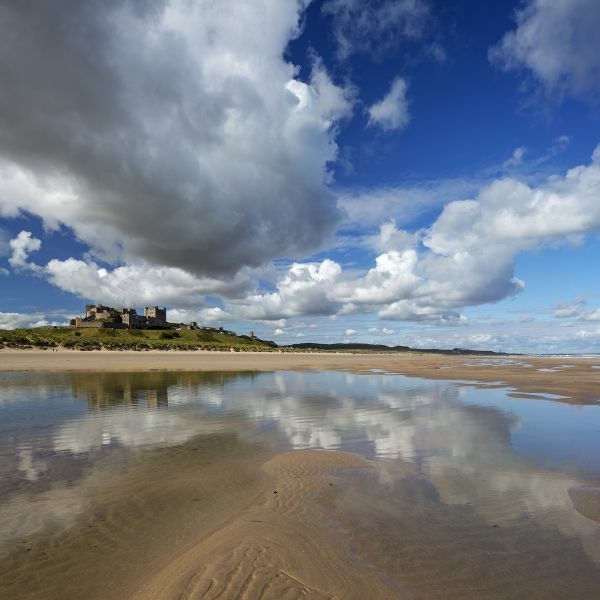 At the former 8th century royal city of Bamburgh stands a magnificent citadel overlooking one of the best beaches in Britain. As the 2nd largest inhabited English castle after Windsor, Alnwick Castle has been a Percy family home since the Norman invasion. It boasts two famous Harrys: he of medieval knightly ‘Hotspur’ fame and of course the alchemist boy wizard scholar from Hogwarts. Northumberland is also home to the UK’s northern most National Park, which covers about a quarter of the county area. One of the least populated and least visited of all UK parks, it has been hailed as ‘the land of the far horizons’. For peace and tranquillity, breath-taking scenery and the visible remains of human habitation stretching back 10,000 years, it has few equals. Located partly within the National Park and bisecting the county east to west is Hadrian’s Wall, the near 80 mile coast-to-coast visible remains of the Roman Empire’s northern most frontier in western Europe. Built by a force of 15,000 men in under six years, it was designated a UNESCO World Heritage Site in 1987. An amazing feat of engineering in its time and an outstanding vision in the landscape today, it is a unique must-see destination and guaranteeing lasting memories for any who visit it. No less impressive is the human footprint of the 200 billion litres (44 billion gallons) of Kielder Water, the largest artificial lake in northern Europe, which is in turn surrounded by Kielder Forest, the largest in England. Here is nature writ-raw on a truly grand scale. The never-ending views are bigger, the myriad recreational opportunities on land and water wilder and the visitor experiences better. Not without good reason has the Council for the Protection of Rural England hailed Kielder as the most tranquil spot in the country. Northumberland is also being marketed as the place which is just as good with the lights off. In December 2013, the International Dark Sky Association conferred gold tier Dark Sky Status upon Northumberland International Dark Sky Park, recognising the largest protected dark sky park in Europe. For pristine, celestial skies bedecked by millions of jewelled stars and numerous heavenly planetary bodies and, of course the unforgettable dancing, rippling colours of the Aurora Borealis or Northern Lights, few places can better Northumberland. A mention is also reserved for the Holy Island of Lindisfarne. A magical, mystical place reached by a causeway which the restless North Sea reclaims twice daily. As the spiritual home in Britain of Christianity from the 7th century AD, its medieval religious heritage dovetails perfectly with its internationally famous castle. Add to this some of the very best beaches in Britain, fantastic architecture spanning the centuries, picture perfect postcard villages, history and heritage and culture at every turn, and of course the friendliest people in Britain, is it any wonder then that Northumberland commands such appreciation from visitors at home and abroad.